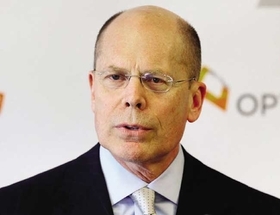 UnitedHealth Group CEO Stephen Hemsley earned $14.5 million in 2015, according to a filing Friday, but he wasn't the top-earning health insurance executive. 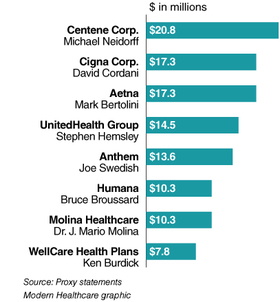 The highest-paid CEO in 2015 was Michael Neidorff of Centene Corp., a national Medicaid insurer. He earned $20.8 million. That does not include the millions of dollars worth of unvested or unsold Centene stock that Neidorff owns. Neidorff and the heads of several other publicly traded health insurers recorded larger cash bonuses and richer stock awards in 2015, a time that was defined by massive mega-mergers but also tumult in the Affordable Care Act's new insurance exchanges. The pay packages for CEOs of seven of the eight largest insurers went up from 2014 to 2015, according to a review of the companies' annual proxy statements. Together, the CEOs of the eight major insurance companies made approximately $112 million in salaries, stock awards and options, bonuses and other compensation. The higher pay reflected the companies' rising stock prices that were fueled partially by a rush of mergers and acquisitions. Centene completed its $6 billion deal for Health Net in March after a protracted review from California regulators. The acquisition opened up Centene to bigger plays in Medicare Advantage and the ACA exchanges, and it fortified the company's position as one of the largest, most powerful Medicaid insurers in the country. The company cited Neidorff's role in the Health Net deal, along with Centene's increased profitability, as the major reasons for his $3.6 million cash bonus. After Neidorff, Cigna Corp. CEO David Cordani was the next highest in compensation, followed closely by Aetna CEO Mark Bertolini. Cordani made a little more than $17.3 million, and Bertolini made just less than that total. Cordani agreed to sell Cigna to Anthem last summer in a deal valued at more than $54 billion, making it the largest in the history of health insurance. Bertolini orchestrated Aetna's $37 billion purchase of Medicare-dominant Humana right before the Anthem-Cigna deal. Cordani could make $82 million if he leaves Anthem within two years of the merger closing, although he made it clear last year that he wants to be Joseph Swedish's successor at Anthem. However, Anthem has not guaranteed Cordani the corner office when Swedish retires. Swedish made $13.6 million in 2015, and his pay didn't suffer even though he was in charge during the nation's largest healthcare data breach, which was brought to light in February 2015 and has resulted in several legal cases. Hemsley still holds an immensely valuable portion of UnitedHealth. He has more than 3.2 million outstanding shares of UnitedHealth's stock, which was worth about $430 million as of April 22. UnitedHealth was pummeled by the ACA's exchanges, announcing last week that it expected to lose more than $1 billion in 2015 and 2016 and therefore would pull out of most of the 34 states in which it sells ACA plans. But Hemsley and the company still closed several acquisitions of its own, including a $13 billion takeover of Catamaran Corp., which significantly grew UnitedHealth's Optum pharmacy division. Molina Healthcare CEO Dr. J. Mario Molina recorded $10.3 million in total compensation, and WellCare Health Plans CEO Ken Burdick took home $7.8 million in his first full year at the helm. Both companies made a few small-scale acquisitions.